Dr. Stephen Jacobs, the owner and President of Jacobs Process Analytics, Inc, has >25 years of experience in design, application and maintenance of on-line analyzer systems. He has installed hundreds of analyzer and sampling systems, including ~75 NeSSI based modular systems, for applications that span from area safety monitoring to closed loop process control. Over the course of his career many sample system components and devices have been utilized, adapted and applied to solve many difficult to handle sample streams. Safety, reliability and ease of maintenance are critical considerations in all of our designs. Our products fill the needs for monitoring/analysis systems while offering exceptional value in performance, maintenance and cost. 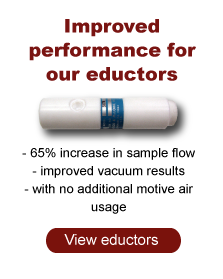 The origin of our business in aspirators began in 1965 when the original Teflon aspirators were developed by Lockwood and McLorie in cooperation with DuPont Chemical Company. 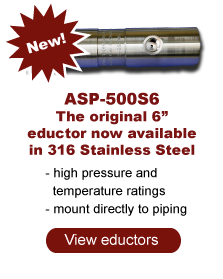 Since then these aspirators have been in use around the globe in various and ever increasing number of applications. The introduction of the Tee-type aspirators increased the breadth and capability of applications, ultimately becoming the larger portion of sales. After obtaining the rights to the aspirator business in 2011, Jacobs Process Analytics Inc. has endeavored to continually improve the performance and quality of our products. 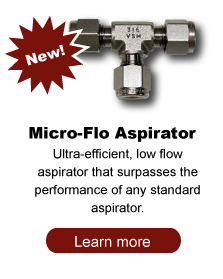 With the development and introduction of the Micro-Flo aspirator, our line of products now offers an aspirator that greatly surpasses the efficiency of competing products, using <5% of typical air consumption by other designs. 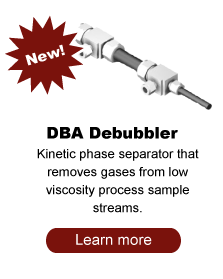 With the introduction of the DBA debubbler, a no-maintenance phase separator that will remove up to 50% gas from continuous sample streams, a new tool for sample system design engineers is available to reliably and simply solve a difficult problem in sample management. This broadens our product line into new areas that are critically important for optical analyzers. Please contact us with your needs and design questions.